Premise- Each show begins with four celebrity bachelors sitting in rotating chairs with their chairs faced toward the studio audience in order for them to be unable to see the single women at first glance. In the first round, the “Blind Round”, the celebrity bachelors will have to determine whether or not they are interested in a woman solely by the sound of her voice and how she introduces herself. Each woman will have up to 30 seconds to be chosen by at least one celebrity; otherwise, she is eliminated from the show. This round is played until each celebrity has chosen three women. 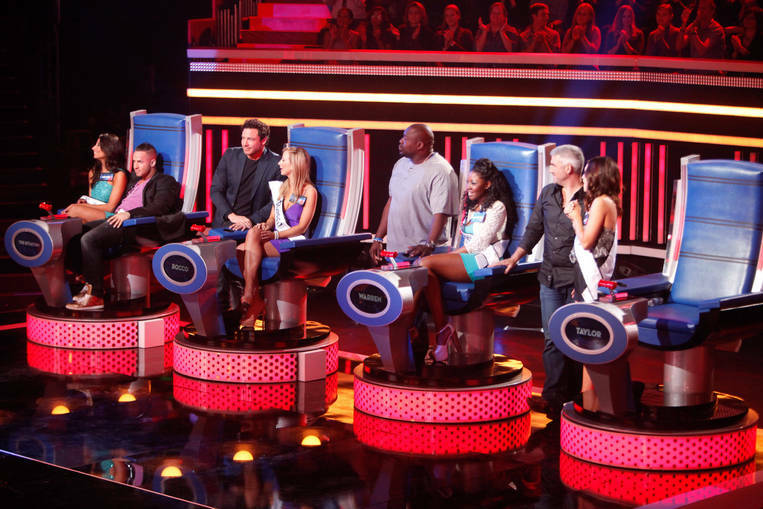 In the second round, the “Speed Choice”, the celebrities will have 15 seconds to ask as many questions as possible to each of the three women they have selected. After the round ends, the celebrities will have to eliminate one woman from their group. In the third round and final round, host Cat Deeley will ask one final question to the remaining two women each celebrity have selected. After the women have answered the question, each celebrity will choose which woman will win the date with them. I don’t like The Choice for many reasons: the lack of originality, the show’s slow pace, and the lack of creativity. The show’s main premise of blindly choosing the single women not only directly rips off NBC’s The Voice, but it also gets uninteresting and predictable within the first ten minutes of the show. Eventually, the guys’ reasoning for choosing a woman will start to get redundant throughout the 30-minute first round. Although, it is an interesting experiment in terms of judging whether you want to date someone or not just by hearing their voice, it is still not an original concept because The Dating Game has already done this. I’m not too surprised that the show has the current arrangement of C-list and D-list celebrities for the panel of single bachelors. The selection of star panelists properly reflects the show’s below par format. There are a few bright spots in the show, however. I have always liked Cat Deely’s humorous and engaging hosting style ever since I have seen her host 20Q on GSN and a few times on So You Think You Can Dance. I also like the quickness the Speed Dating round of the show and how the celebrities and women have to think on their feet when asking or answering questions. That was very interesting to watch. Overall, The Choice is a dating game show FOX could have done without considering that they are blatantly ripping off another show (which is no surprise for a FOX show). This show is simply a mixture of The Dating Game, The Voice, 30 Seconds To Fame, and the Miss America Pageant. The producers could have at least thought of a better show title than one that rhymes with the show they’re ripping off, but I digress. The only selling point this show has are the celebrity bachelors whom appear on the show on a weekly basis. I will be very surprised if this show lasts for more than one season. Watch new episodes of The Choice every Thursday night at 9:00pm on FOX!! !